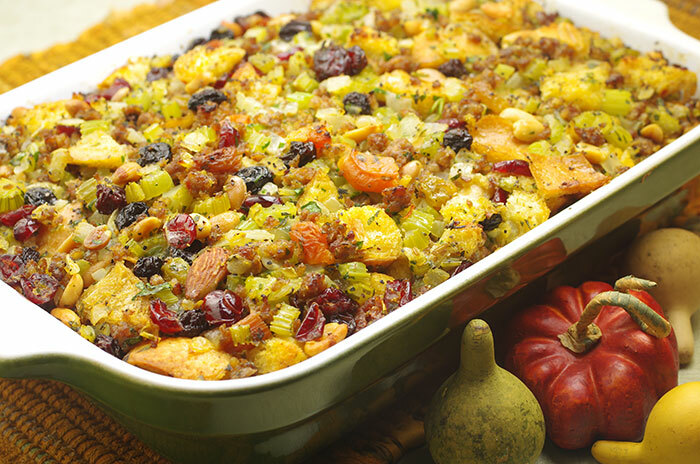 My friend, Kathy Blue, the queen of Thanksgiving and co-author of Thanksgiving Dinner, suggested I use trail mix to make this delicious stuffing. You can serve it in a large casserole or stuff it into a 16-pound turkey with some left over to bake separately in a medium casserole. Either way, the crispy, nutty fruit flavors are a holiday hit. Make sure to start this a day ahead to dry out the bread. 1. Preheat the oven to 325°F. Place the bread on a baking sheet. Toast for 30 minutes, or until lightly browned; turn after 15 minutes to brown evenly. Or place the bread on a baking sheet and let sit out overnight, turning at least once, until dried out. 2. In a large skillet, melt the butter with the oil over medium heat. Sauté the onions for about 5 minutes, or until softened. Add the celery and sauté for about 4 minutes, or until crisp-tender. Season with salt and pepper. Transfer to a large bowl. 3. In the same pan, brown the sausage for about 5 minutes, stirring occasionally to break up the meat and to keep it from burning. Let cool and add to the vegetables. Add the chestnuts, trail mix, thyme, sage, parsley, and bread cubes. Mix to combine. Season with salt and pepper. Slowly add the broth, mixing carefully and making sure that the stuffing is moist but not too compact, especially if you are planning to stuff a turkey. Taste and adjust the seasonings. 4. Stuff the turkey or oil a 2-quart baking dish and add the stuffing. Dot the top with the butter. The stuffing can be compacted because it will not expand in the pan. Cover tightly with aluminum foil. 5. Preheat the oven to 375°F. Bake the stuffing for 30 minutes. Remove the foil and bake 15 more minutes, or until the top is brown. Serve immediately. Make up to 2 days ahead through step 3, cover, and refrigerate. Remove from the refrigerator 1 hour before baking. -	Use precooked chicken-apple sausage and coarsely chop after browning.